Correspondent Q sends in a photo of a range rover. ﻿I'm frustrated that I've been unable to find a winner to your competition this month, despite trying. I did spot one Range Rover in Park Street in a pay and display bay and thought I'd won, but the ticket was well over time, so it disqualified itself. However, one walking through the Aldi car park in North Street yesterday I watched this one park perfectly legally! 'Nuff said. This car is actually being very considerate. One reason nobody wants to park near a 4x4 is even if they take up the parking space without infringing on yours, you know their doors will leave another dent in your vehicle when they open them. By parking so as to leave room for the doors to swing wide without bashing anyone, everyone is happy. Q therefore wins the December 2008 Legally Parked Range-Rover award! Some researchers up in Leeds have published a study of GPS-speed limiting cars. The central cycling groups are in favour of it -because the idea of cars not speeding appeals- and the "unionists" -the Association of British Drivers and their anti-speed-camera allies are against it. The Leeds study took volunteers and explored how voluntary and mandatory speed limiting worked, then interviewed various people to see what they felt of the idea. What they did not attempt to do was impose speed limiting systems on unwilling participants, people who wanted to drive fast. Doing so would not only show how acceptable the idea was to the country at large, it would show how willing people were to subvert the system. A realistic study would therefore instrument a city's taxi/minicab fleet (I can think of a city), or all drivers convicted of speeding coming off a driving ban. As it is, the closest we have to speed limiting infrastructure we have today are the tachographs in lorries, that monitor speed and working hours. Which is why Ross Anderson's wonderful book Security Engineering has a section on subverting tachographs, right between Banking and ATM security and locking down Nuclear Command and Control Systems so that high-energy physics events only take place with senior management approval. Trying to limit vehicle speeds from an bit of in-car electronics and GPS is as workable as the film companies trying to restrict DVD players to specific regions so they can charge price differentials on different continents (result: multiregion players cost a 10 pound premium). It's as workable as the games console companies trying to stop you hacking into the controller so you can play downloaded games burned onto your own disks. Results: modified firmware chips are widely available. These consoles are not easy to hack, either; it took someone at MIT three weeks to 0wn the Xbox. If there is money to be made from subverting something in your possession, be it a games console, a DVD player or a tachograph, then someone will do it. And if the hack is a software one, then it usually scales well. Only one person will need access to the Scanning/Tunelling Electron Microscope, the rest just pay for the results and some modified firmware. Imagine that three years from now, every car comes fitted with mandatory speed-limiters driven by GPS. How would you attack it? Attack one: lie about your location. Civilian GPS isn't secure; it isn't signed and anyone could generate spoof satellites. An in -car pocket GPS Jammer would generate signals telling the satnav unit that you were in France or Germany and could drive as fast as you like. This is a good attack as when the jammer is off: it doesn't show. When the speed limiter is checked in the MOT, all would appear well. Attack two: firmware hacking. All embedded computers with upgradeable software can be subverted with new firmware. There may be some checks on the firmware -that it is digitally signed by someone trusted-; these need to be subverted first. If you can roll back to the legit firmware during the MOT tests, nobody will know. Attack three: hardware patching. The common games console attack. Shows up in a physical audit. Attack four: don't update the maps. Assume that every year, speed limits come down. There is no benefit, then, in updating your maps. Snap the link to the GSM modem, or refuse to pay the 10 pounds/year for updates. If the MOT checks that you are up to date, someone needs to record the previous year's update, and after the MOT, you replay the older map into the SatNav. Attack five, and this is the fun one: generate fake maps. Create one that says the max speed for the country is 120 mph. Install it in your own machine, sell it to others. At this point the security experts are going to say "ah but our system will only download signed maps from a trusted provider". Which may be true, but rests on certain assumptions about the security of things like HTTPS, those web sites with the green bar in the browser window, which tell you that that bank site really is who they say they are, and not some russian Phishing site. On the same day that the UK government published their paper on SatNav-based speed control, a group of Dutch hackers published a lovely paper on how to subvert HTTPS by creating a fake certification authority. It's a fairly complex paper and hard to understand, the good news being none of us need to know the details. What is important is that people like Ben Laurie, key developer of the OpenSSL stack and Apache SSL module is scared. Because right now, this week, we can't trust HTTPS sites to be who they say they are. There are very serious implications for the web for this, but they would also impact things like satnav based GPS. If I could make a fake map that removed all speed limits from cars sold after 2012, how much would it be worth? If SatNav-based-speed limiting is flawed, what to do? Well, why not charge a bit of road tax based on peak vehicle speed? Or just speed limit all cars to 100 miles an hour, more than enough for UK overtakes and driving -and to get you to the French Alps when needed- but removing demand for big-engined cars that waste petrol at normal speeds. Or rely on the ANPR-instrumented motorways to catch speeding cars, and similar infrastructure in-city. Because you are going to need such cameras up to keep an eye on the older cars, the cars from the rest of europe, and to detect people who have just paid for my high-speed map of the country. There are lots of options that don't rely on tamper-proof hardware being embedded in cars with tamper-proof maps and reliable GPS constellation data received in real-time. It would be one of those things like biometric ID cards: a expensive way to not solve the underlying problems. Just before Xmas, someone in a Ford Puma coming off the M32 approached Cabot Circus a bit too fast and ended up in House of Fraser, after bouncing off the roof of an Audi waiting at the lights. The Puma driver ended up in Critical condition at the BRI and went on up to Frenchay for intensive care, the driver of the Audi also ended up at the BRI for chest injuries. The E.P. has some photos. and more text, using the term "accident" as they invariably do, showing a weak understanding of the concept of causality. This is pretty messy and hopefully all involved will recover; we look forward to the result of the police investigation. What is clear is that the Puma must have been moving fairly fast to travel in the distance and manner that it did. 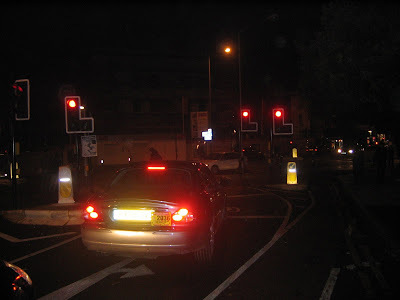 Late at night that whole stretch of dual carriageways between the St James Barton Roundabout, St Pauls Roundabout and templemeads often have cars nipping around very fast on it. The roads are generally structured/styled for fast driving, but it is still an inner city, with junctions, lights and other road users. Which makes for a fairly dangerous combination. One thing to look at here is whether the new junction changes at the end of Cabot Circus help things or not. It's clear that whoever designed the turn-left feed from Bond Street at the Newfoundland Way junction didn't consider bikes -or other vehicles- running lights, or they wouldn't have given it such atrocious visibility when you look right. When you get a green light, there's no way to see if anything decided to run-the-red without pulling out. The other thing to consider is how that Dagger-into-the-City, the M32 contributes to excessive speed in the city centre. On a weekday commute the jam begins at eastville, so cars reaching the core have been doing 10mph for 15 minutes. Late at night you can do M4-to-Cabot Circus in 6-8 minutes, at which point your expectations of viable speeds are pretty unrealistic. Another contribution for the Range Rover competition, this one on the pavement and yellow lines opposite Kingsdown Sports Centre on a Saturday afternoon. Sadly, RR VNO5KZU fails the parking competition because it's too close to the corner. Out of the BBC archives comes a documentary showing how the hotwells bridges and M32 will improve the city. It's a lovely documentary, looking at the lovely scenery, and showing artists impressions of the beautiful flyover. It was a different time in those days, a time of progress. A time when running a motorway was progress. Indeed, a time when the word "motorway" itself was new; the documentary uses "Autobahn" on the assumption that the audience will have heard of that word. Over from the Bristol Cycling Campaign comes their proposal to the council on a walking strategy for Bristol. All of the artwork appears to come from contributions to this site, which shows that our secret plan is coming to fruition. Bristol Traffic is becoming the city's best public database on transport issues, all stored and indexed by our strategic partners Google and Yahoo!, and we gladly give permission for photographs to be reused if we get credit. (Please check first, some third party submissions via flickr may have different. We think you should read the entire document. It's interesting to compare the campaign's point of view: pavements should be valued, not treated as space for cars and mobile phone base stations, to that of the local press, which imply that it is bicycles that are the greatest threat to pedestrians. The Evening Post appears to be trying to create a split between walkers/cyclists, rather than unity against a common problem: cars and the danger and inconvenience that too many of them are creating in the city. 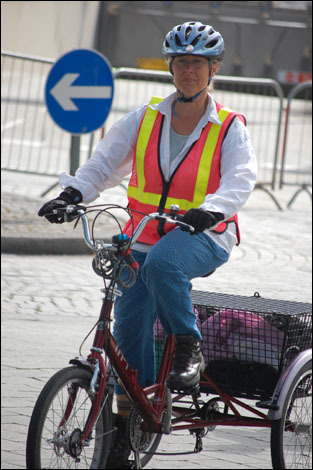 The Bristol Cycling Campaign strongly believes that a walking strategy is needed. Walking has to be recognised as the primary mode of short-haul transportation in the city, and is an integral part of any public transport story. It has to be made safe. Keeping the pavements clear of clutter. Active engagement of other groups that care about pedestrian safety. Local facilities: shops, pubs and similar. Local pubs. Walking to the local pub helps reduce drunk-driving incidents, but walking home after drinking alcohol does significantly increase the risk of being hit by a car. Schools. Walking, scootering, kid-bike-on-pavement and kid-on-bike-with parent should be viewed as the preferred transport options to primary school; teenager on their own on foot+public transport or bike that for secondary school. 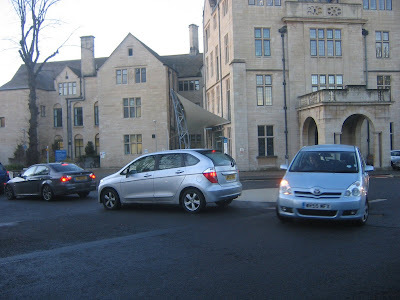 University: no students should be driving to Bristol University. Public Transport hubs. Pedestrian access to the central bus station, templemeads and, to a lesser extent, Parkway, stand out here as opportunities for improvement. Local bus and train stations. Without the ability to get safely to the access point to the public transport infrastructure, this infrastructure is inaccessible. Health care and social services. These should be accessible by someone with physical disabilities. Central shopping areas: Bedminster, Whiteladies road, Gloucester road, Cabot Circus and Broadmead are examples. These can be visited on foot or foot+bus. We do not directly discuss walking to work. For those people who live in or near the city centre, this is already an effective option. Many people do walk round the city. When the car lanes are too narrow -as here, on Whiteladies Road, where two southbound lanes try and squeeze alongside the bike lane, the bike lane suffers. It was too narrow a lane anyway, you shouldn't really use as it is too dangerous. Locals know that; it's documented on Bristol Streets. But what about visitors -how will they know it's dangerous? That's where the self-degrading paint comes into its own. If you paint a bike lane in a paint that is strong enough to withstand bike use, the lane stays red -bike lane. But where cars, buses and here, ambulances, go down the lane, their accelerating and braking tyres scrape off the red, leaving black underneath. This provides a valuable cue to visitors that this is not really a bike lane, and should be avoided unless they are tired of life. A polite note from one of the Trustees of the Narrows advises that offroad biking round their St Werburgh's wilderness area is not encouraged. Alternative offroad commute options are to be used. Here is one: UWE to Frenchay Park road via the Portmerion estate, and down that track. Over at the roundabout, and then turn right into Eastville park. Which brings you to the Eastville Park Technical Area, here being used properly by someone who knows how to handle a bike: "K". In a fit of user incompetence picasa managed to delete the video, where he described his bike -Specialized Hardrock- with some nice uprated Marzocchi Bomber forks. With the way he was getting the bike over the jumps, those forks are earning their keep more than most of the MTB suspension forks taken round our city. Nice riding, and a reminder that there some excellent places in-city to push a bike to its limits. It is nice to get an email from Heather Anne Watts announcing her stolen tricycle has been recovered. Thanks to all of you who have displayed posters and passed on the message about my stolen tricycle. The police telephoned me last night to say a member of the public had taken my tricycle to the local police station. I am off to South Bristol to collect it later today. That is lovely news. 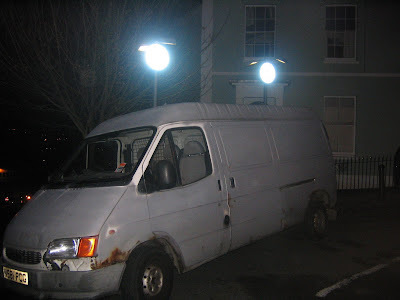 This theft got a lot of publicity, and because it was such an unusual vehicle, actually recovered. A rare and welcome event. Thursday December 25, 2008. A day to celebrate. Thursday: Thorsday. Thor - the Viking God. A good of thunder and thunderstorms. And what do thunderstorms bring? Rain. Which, when mixed with soil, produces Mud. Thor, then is the Viking god of mountain biking. Let us celebrate him by getting out there and covered in mud. There are long-whispered rumours of a secret downhill race in boxing day, one down the various staircases of Bristol. More details on this would be welcomed. If it doesn't exist, then we should organise one. For now: Ashton Court golf course cafe, 10am, boxing day, with whatever Santa brought you. 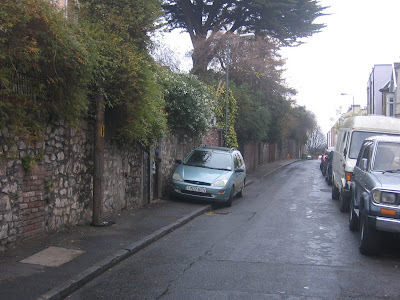 A parking space in Kingsdown! A miracle! It's Christmas eve , and the town is quiet. Over in Kingsdown there is space for two cars to park, on the road, legally, without blocking fire engines. The Christmas week is the only time this happens. For people wanting to visit this annual miracle, the ritual of the open parking space, it's on Kingsdown parade, just opposite the car LL51ZSY on the pavement by the double yellow lines. Also in Kingsdown news, a note came through everyone's letterbox asking everyone to email their local councillor to fight the CPZ proposals, which are going for review at a council meeting on January 5th. This opposition is being run by the Keep Parking Free group, who are generally from outside the zones. They don't want parking zones near them as not only will it remove places to drive to, it puts pressure on areas just outside the zone. Unfortunately, Kingsdown is already in this state: it's on the fringe of the inner city, and gets a lot of hospital traffic, amongst other things. Not visitors, commuters. Though if residents parking does get rolled out, and disabled cars can park freely, then it does provide a large amount of extra disabled parking not far from the BRI. Coming out of the Kingsdown residents group is a counter-leaflet. Mark January 5th for your diary, as the council house could be fun. Look! The Bristol-Bath Railway Path has its own Yule tree. Apparently another viking tradition was sacrificing a goat; the Yule Goat. Going down to St. Werburghs on Thursday lunchtime and sacrificing one of their goats has more appeal than watching the Queen's speech. Maybe it's time to bring that tradition back. 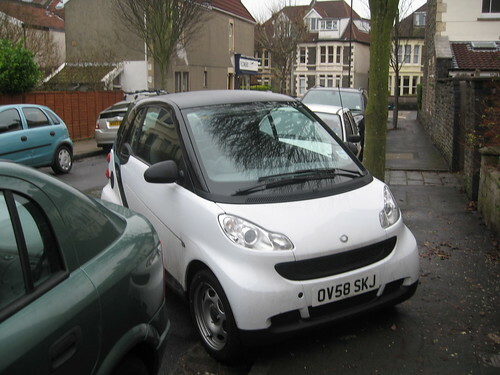 A new contributor "Z303" sends in this picture of a SmartCar OV58SKJ showing why they are invaluable in a city, here Devonshire Road, Redland. There is no way you have been able to park a normal car in such a narrow gap between the car in front and the tree. By parking diagonally, wheels slightly on the pavement -but not enough for a pedestrian to notice- the back of the car does not stick out into the road. This means it hampers normal traffic flow much less than a full-on sideways park. Slick. People say "How to contribute". 1. Park or drive in entertaining ways. It has to be funny, as we are running out of things to say about pavements, and will then have to retire, forever in third place in Venue's Best Bristol Web Site awards. Getting ticketed or towed is one option, but quite hard to pull off. Driving the wrong day down one way streets good, endangering pedestrian schoolkids while on the schoolrun yourself a classic. Blocking bike lanes is an easy way to participate, such as the entry to Nine Tree Hill in Fremantle Square. 2. Get photographed by one of our many contributors. Remember to be polite and thank people for their contribution. Contributors should send their submission to bristol.traffic at gmail.com . Its hard to get night photos, incidentally. Avoid reflective things and try and use bike lights and fast ISO settings over flash. We like registration numbers and street locations, for the database. 3. If you can, give us some commentary in the style of the blog. Criticisms are not usually appropriate, unless they are of bicycles having the audacity to cycle through out the narrow gap left in the new zig-zag junction without even looking. Better to observe that this bit of Fremantle Square is outside the CPZ, which begins at the car to the left. Therefore this van N581PCG sill still be able to park here when the CPZ rolls out and has nothing to fear. Don't expect an immediate reply; the blog is filled up with a few days postings at a time, from our own and other people's pics. We like pictures that cheer people up. We can't handle downbeat "oh look the range rovers in Montpelier are here" photos unless you can come up with a new way to make it entertaining or positive. We know they are there. They are always there. 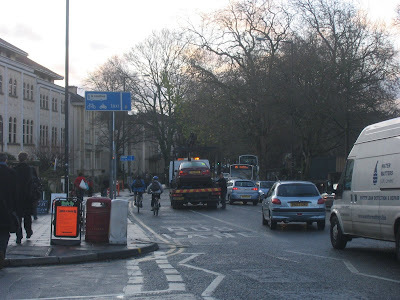 We don't just want parked cars, stuff about the general Bristol traffic situation goes in. We like photos and text, and try and do one or more postings a day through advanced posting scheduling. You don't really think we were up and online before 8 do you? The winter solstice. A time of darkness and fear, fear that summer will return. The new gods, the christian ones, have tried to put their brand to our celebrations, but we know better, we remember. Whether it is called Christmas or even Hogmanay, we know that the longest night of the year is a time to remember the auld gods, the ancient rituals, and their dark, dark demands. 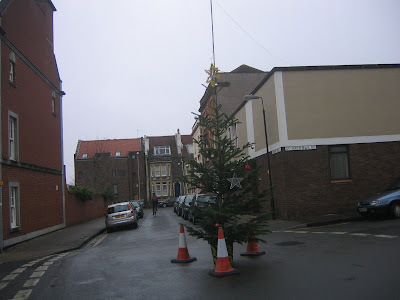 In the centre of Kingsdown, the "quaint" part of the city there is a tree in the middle of the road. It apparently appeared on the 21st, on the solstice. Some people will view this as quaint local celebration. Some people. Outsiders. New folk. Those people don't know that Kingsdown always celebrates the auld festivals. They may hide them, make them look pretty, but these community events always come out on the old days: December 21, May 1, and others. In May: the dancing round dressed as a tree, a tree later burned a few miles north. In December, another tree, and perhaps a more discreet burning. Because modern society frowns on human sacrifice. As usual, it's the same people who eat meat but don't like the way animals have to die for it, if we want our daylight back, if we want decent weather, somebody has to pay the price. And in Kingsdown, enough people remember the auld ways, the auld, dark rituals, and the price that we have to pay for everyone's benefit. It's not that these are happy enjoyable events -no, the old gods don't do happy, but they have needs that must be met. The driver of the car M21PKE will be returning to their vehicle this weekday morning (08:52), to find they have no vehicle. Parking services actually runs at a loss for the city, and the actual overhead of towing a car not only costs a lot, it appears to bring all motor traffic to a halt, as the lorry blocks the other lane heading in to down, forcing them to swerve in to the oncoming lanes. The bikes and pedestrians are unhindered. 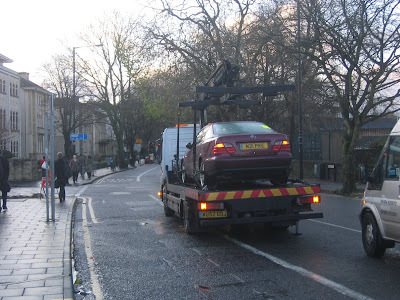 The economics of towing (max: one vehicle per hour) show why clamping is something to consider. Yes, it leaves the bus lane blocked, but it warns everyone off, and is much easier to go round clamping a set of cars than towing them. While cycling along the pavement last week, one of our correspondents almost fell off their bike after riding over this slippery piece of plastic found in the middle of the path. It appears to be a threatening note to a car in Redland, Britain's Greenest Suburb, as the car was blocking another car in a driveway. Which is ironic in so many ways. 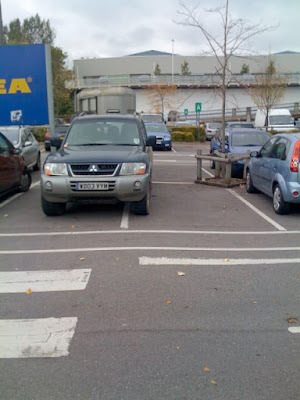 The note says "THIS TYPE OF PARKING DOES NOT ALLOW ENOUGH SPACE FOR US TO GET ON AND OFF THE DRIVE. NEXT TIME........!" All in capital letters, all in green ink. According to wikipedia, letters written in green ink with excessive capitalisation are often the sign of impending insanity, and feared by all letter readers of newspapers. Presumably the recipient of this letter was so scared by the ink, the text and the capital letters that they drove off in a hurry, discarding this note in the middle of the pavement in their terror, never to darken the gates of another driveway again. For anyone wishing to emulate this letter writer, the font Felt Tip Roman can be used when mass-printing such threatening letters while still retaining the hand-scrawled-by-someone-hearing-voices appearance. It's what we do. When the voices tell us to. We welcome a new contributor today, SimonB, who sends us a snap of a black VW golf in the motorbike-only parking area on Woodland Road, near the University. It's in the solo MCs and bicycles section. Normally that would get you into trouble. But car X833EKM has nothing to fear? Why not? Is it because everyone knows that BPS knock off at 5pm and you can do what you want afterwards? No. It's because its a black car in a black parking space on a black night. Nobody is going to notice the car parked there. And if you can't see it parked, well, it isn't there, is it? Its becoming apparent that the driver behind this week's crackdown-on-cyclists was not a central council plan, but driven by the local police from their local community engagement, the PACT process. 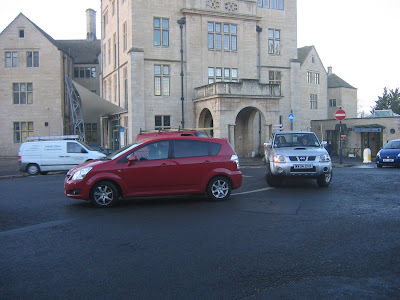 For the Cotham beat, inconsiderate cycling was seen as important. Though they haven't defined whether inconsiderate cycling means "being in my way in a car"
1. Traffic offences, namely speeding on Hampton Road and No Entry signs contravened on Nugent Hill and Grove Road. 2. 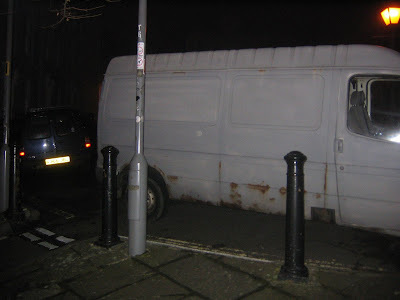 Pavement parking on Meridian Road, causing obstructions. 3. Wheelie bins and skips obstructing pavements on Cheltenham Road. Although they have apparently issued 21 tickets to cars contraflowing the Nugent-Hill one-way system, its clear that isn't a very good deterrent for all the other cars. And a tour of Meridian Road will show if that has been fixed. Returning to the photo above, its in Kingsdown, which doesn't list cycling as a problem. Which is a success. It's a success for those people in the community who, by carefully placing a car in the demi-drive with the two-bar sticking out, can be sure that anyone who attempts to cycle down this pavement will come off. This area's priority is : Parking - particularly Nugent Hill, Dalton Square and Clarence Place, with particular concerns regarding access for emergency vehicles. Which could explain why we had that incident of cars blocking the pavement getting tickets or warning notes, but cars on the pavement not getting a mention. Nobody complained about pavement parking. The next PACT meeting for this area is Thurs Jan 22, The Centre for the Deaf, King Square, Kingsdown. This would be a good opportunity to infiltrate this bit of the city and demand a harsher treatment of cyclists. Another contribution to the Range Rover parking competition. It's very close to winning. YT06TFN isn't on the corner, and the keep clear sign outside this children's nursery is just a hint, on a par with the "pay attention to the safety instructions" request they make on planes. So the only thing that causes it to fail our legally-parked-range-rover contest is the wheels that are barely on the pavement. A very close failure there. Incidentally, a google search for the registration number shows up a car dealer page implies that it was on sale in Droitwich as of 04 November 2008, for 30,000 pounds. And that earlier, it was on sale for 35,000. Which means that although it cost a lot, it cost less than it did. Dropping 5000 pounds is quite serious depreciation, implying that not so many people want them. With the premium C-charge in London being removed and the cost of petrol dropping (the garage site says its a V8 BTW), the main threat to owning a car like this is the parking problem and the planned Group-G road tax hikes . But a 5000 pound discount costs-out the group-G tax for a decade, and its clear that nowhere else is rolling out congestion charging, so it looks like a bargain -provided the resale value doesn't fall as agressively. And as the probability of labour staying in power is probably less than 40% right now, those group G tax rises may not kick in. Leaving parking as the only issue. Or not, as the case may be. Now that SatNav is affordable, anyone can drive round like they know the secret ways of the city. Whereas before the knowledge gave those who studied it an edge, now there is nothing to stop anyone getting a minicab license and driving round the city with as accurate an understand of the ways round it as you'd gain from years of learning. How then can a commercial taxi driver make money and ensure that there is still a barrier to entry to competitors. Simple: a new knowledge. The commercial SatNavs know the one way streets. That is a strength: you don't need to know them, but also their great weakness. Their routing algorithms assume that you can only traverse a one-way street in the direction the arrows point. That is, the collection of streets, the graph, is a directed graph. Experts in the city can use this to their advantage. By knowing exactly which little one-way street they can nip down, they can come up with a more optimal routing through the city. For example, ask a SatNav how to get from Kingsdown to Cheltenham Road, and it will come up with two solutions, neither of which work well at 17:10 on a weekday. 2. Horfield Road, Park Row, Jamaica Street. A driver with The New Knowledge will know another solution. The one way bit at the bottom of Nugent Hill. It does bring you out into Arley Hill, but if there is a big traffic jam., you've missed it. 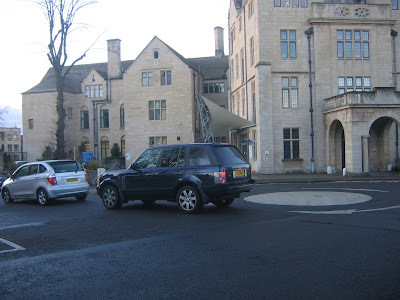 This blog strives to avoid making any accusations that could be considered libellous, and therefore does not state whether this taxi, the Jaguar with the Bristol City Taxi #2036 license plate on it, has done any such action. Instead, we will say: if they had done something like that at about 17:00 hours on Thursday December 11, 2008, they had better not have had their SatNav unit turned on, because those little units not only make suggestions on where to go, they record where you went. So if this taxi had driven the wrong way down the Nugent Hill one-way-section, the car would remember the fact. Which is another piece of knowledge you need to remember, isn't it. The SatNav may be your friend, but only your friends can betray you. Here is the podium of the 2007 Bike Fest, under-5 category, with the three happy winners accepting their medals . As only three kids took part, there was much joy all round, and no small child crying all the way home in disappointment. On a similar note, we are pleased to announce that Bristol Traffic won 3rd place in Venue's 2008 Banana Awards, category "Top Web Site". Specifically, they said "A one trick pony which mostly takes the piss out of selfish and irresponsible parking practises of our fellow citizens". Surely they meant "the city's first rigorous data collection and datamining exercise on traffic and parking, raising traffic engineering from pre-elightenment superstition to that of a modern data-driven, evidence-based science." But maybe its because we keep that aspect of the project secret for fear of scaring people off. But we do not take the piss, Oh no. We celebrate their inventiveness! We'd like to thank all the drivers whose contributions to the cities streets gave us something to talk about, and the many people who posted their photos in. Sadly, our need to avoid libel prevents us from posting most of the text that comes with the pictures, but we can assure everyone it is appreciated. And the year after that, first place on the upturned dustbin with the packet of Quavers! This montpelier road almost has a pavement that works. In many ways that's unusual: many of the roads -Richmond Road, St Andrews Road, only have pavements that are visible to archaeologists that dig under the layers of cars. Presumably if they go deep enough they will find the roman-era roads, roads that will show that the natives parked their horse and carts half off the road. From a pedestrian perspective, any number of cars more than zero means the pavement is broken. You can't go along it. If you are blind: bump. If you are in a wheel chair, problems. And if you have a push-chair its on road. But that's OK. Because its a quiet road. The narrow bits wil force the cars to slow down. And there's no need for the police to enforce cycle on pavement rules here. Indeed, we suspect if anyone were to attend the PACT police-community meets here, it won't be bikes on pavements that people will be complaining about. There are big problems in the US regarding short-term funding of General Motors and Chrysler, and, to a lesser extent, Ford. Having seen the size of the cheque the governments have written to keep the financial system alive, the CEOs each flew down from Detroit to Washington D.C on their own personal jets, then demanded $25 Billion to keep themselves alive for a year, where they believed all their problems would be solved. Hmm. This is a photo of a place made famous by a Stanley Kubrick-directed Stephen King film: the Shining. The one where the caretaker is persuaded by the ghosts of the hotel that all is problems will be solved if he cuts his family into little bits and then kills himself, because, "All work and no play makes Jack a dull boy". Although the interior is completely different. 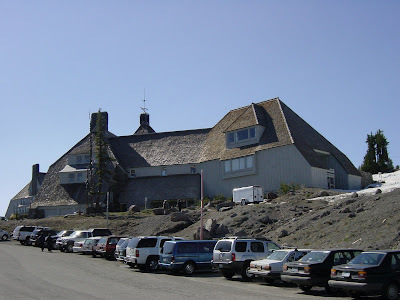 and there is no room 237 to stay in, its a lovely place to visit; a fantastic climb with a great view of Oregon's Mout Hood behind the building, Mount Hood Lodge. Here though, are how most of the visitors have got there: in cars. The closest three cars are VW Jettas of different eras: golfs with their luggage removed. Nimble and comfortable. Everything else in the parking lot looks like US product or Japanese toys made to compete: SUVs, Minivans and Pickups. All of which operate on a simple assumption: fuel costs $1.60 a gallon or less. The big three manufacturers had a business model selling overweight truck-based designs with an overweight, under-technological V6 or V8 engine to pull it around, the engine, automatic gearbox and all-wheel transmission adding to the weight and inefficient engine, resulting in SUVs and pickups where doing 20mpg is considered economical; 12-14 MPG bad. The white SUV poking out, a GM Chevy Suburban, probably did 12mpg. Imagine, then if the US had, instead of embracing fuel-inefficient SUVs, had embraced smaller EU-style cars. Cars and "wagons" where a 2.0L engine would be considered big, have a turbocharger on it to make it fun, and deliver a mileage of 35-40 mpg (US gallons here; 4 Litres/gallon). The burn rate of the fleet would be half what it is, so even if the cost of fuel was still above $4/Gallon, it would be affordable. And if the petrol demand of the US fleet was half of what it would be, well, cost of fuel would have been lower even before the recession kicked in. We'd still be vulnerable to the incompetent risk management of the banks, obviously, but maybe things would have been better. Anyway, it's moot. The US embraced 10-14 mpg toys as what real men drove, and we are all stuffed now. Regardless of whether they get their money or not, the CEOs will be running round the factories like Jack Nicholson with his blood-coated knife, desperately trying to do what it takes to stay in the game. Everything except give up their planes, and the SUVs, of course. Delbert Grady: [referring to Jack murdering his wife and son] Mr. Torrance, I see you can hardly have taken care of the business we discussed. Jack Torrance: No need to rub it in, Mr. Grady. ﻿A lot of people have been coming off their bikes on the railway path or other parts of the town this week. Special mention to Fraser, Sarah, Jenny and Caroline for all coming off on the RP. Remember: tarmac gets slippery when covered in ice. But mud, mud gets crisp and crunchy and barely sticks to you or your clothes. Here is the view from the Narroways. 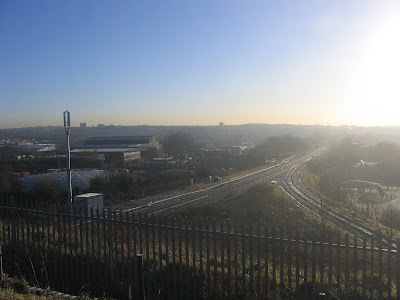 The railway line goes over the M32, and is what could gain from having the North Fringe Expressway on it. The appeal of this route is it would be free of traffic, traffic lights, and hill climbs. ﻿Sadly, that will mean no downhills either, which would be boring. We suspect Josh's lack of decent brakes on his runaround is affecting his judgement. ﻿Being bitterly cold, most of the dog walkers are having a lie in. ﻿This leaves it nice and quiet: a little bit of up and down track in the heart of the city. That's St Andrews in the distance. In the foreground, a flight of steps with a steep dirt option to the side. 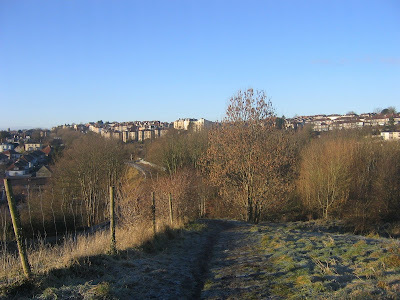 Down the steps, theres a frosty bowl of frozen grass, followed by a fun downhill to St Werburgh's. This is the kind of commuting to enjoy on a winter morning. An empty trail on a crisp day. Once down in St Werburgh's, there's a path on to Muller Road. This is going to be part of the cycling city North Fringe route. 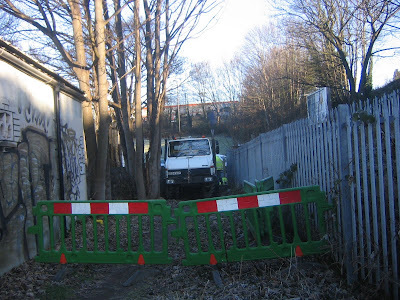 Josh thinks that the railway bridge should be used to avoid this road, on account of it being the busiest road in the area, but the council does not yet have a plan to deal with how the crossing at the existing endpoint of the path. Of course, that is not an issue right now, as the Muller road roadworks have taken this path offline. It is not clear what paperwork is required to formally close a route, and whether any such paperwork has been filled in. What is clear is that if you go to the end of the St werburgh's-Muller Road path, you have a bit of a climb back up again, at least for the next week or so. Apparently the police were out on Zetland road on Wednesday morning, enforcing traffic rules on cyclists. This means sadly, that nobody was around at the top of the hill, St Michaels Hill mini-roundabout, to enforce traffic rules there. Such as the "do not block a junction" rule. Roundabouts are probably the ideal junction as far as the Association of British Drivers are concerned. No lights, no pedestrian time to stop cars getting through, cars get right of way over any schoolkids trying to get from one island to another. Sadly, queue theory, one of those pesky little things the ABD don't agree with (along with pollution statistics, finite fuel supplies and global warming), kicks in here. It is impossible for more vehicles to enter a roundabout than leaves it. 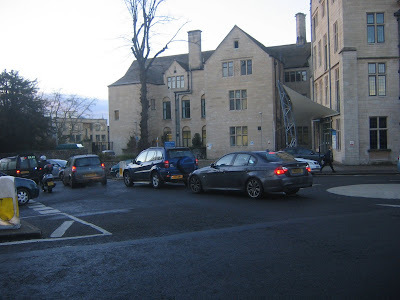 If the majority of vehicles are heading in the same direction -here down St Michael's Hill and then to the city centre-, then the maximum load of the roundabout is the same vehicles/hour as that single road can sustain. At this point, law abiding cars will stop and wait patiently for the junction to clear before pulling out. Here we some some waiting patiently and only blocking traffic leaving Cotham Road. Soon they are joined by a car full of school kids, WP05VXC. There is still enough room for cars turning right off St Michael's hill to get through to Cotham Road, though visibility is hampered. As the traffic crawls forward, a Range Rover pulls out to take up the space. No cars can turn right from Cotham Road to Hampton Road. 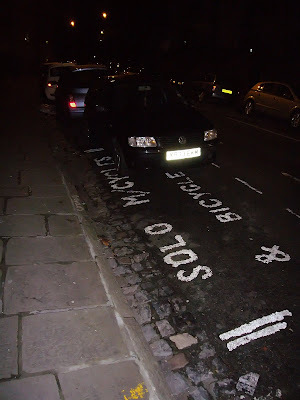 No bikes can get over to go down Cotham Hill -it's bikes only in that direction. 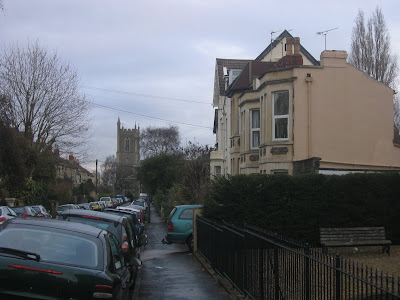 Hampton Road to Cotham Road is the only routing that is still live. The range rover L12BXF is soon joined by a red Toyota from Cotham Hill. The RR hasn't moved that far forward, so now the line of cars continues across the junction. A pickup from Cotham Hill now seizes the opportunity. Unfortunately, the Toyota (kids inside again) prevents the pickup behind it from even completing the turn; it has to sit with its indicators on. Blocking the exit for any vehicles heading up Hampton road, such as the two vans behind it. There we have it. A complete roundabout failure in the space of 30 seconds. The throughput of the roundabout becomes that of the slowest moving road off it: 0 vehicles/hour, so delivering the same throughput to anyone trying to head in any direction off the roundabout. What could be done to prevent this? Perhaps we could have someone issue spot fines for vehicles blocking a junction? Perhaps a local newspaper could start a campaign against people who seem to be going out of their way to inconvenience cars? 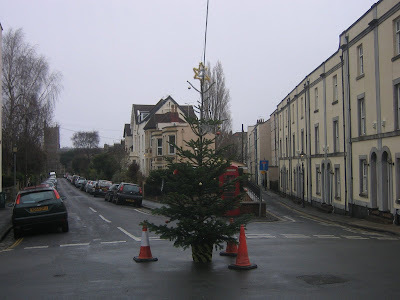 Here at Bristol Traffic, we think such persecution is uncalled for, and would be another sign of an anti-car city. Here is the Highbury villas road by 11:10, (disclaimer: on a different day). There are a lot more cars. Where it is parked half into the middle of the road, you aren't even going to be able to make it round the corner, except maybe by reversing to the left and then going out forwards. That is not yet a move they include in the driving test, but it has value. Assuming that at 0900 the residents and any commuters filled up the parking "spaces", this is the overflow for the students. Driving down here is committing, and if you are coming over to get here in time for your tutorial, you don't have time to circle round the rest of the area, which, to be honest, isn't going to have any parking spaces either. You may as well accept that a hint of a corner is all you are going to get and take it. 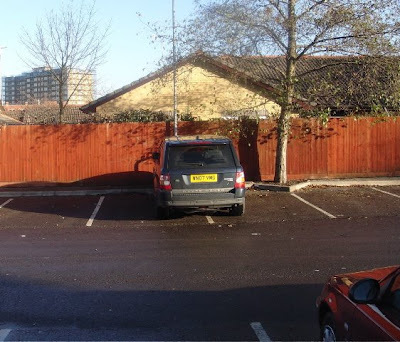 The owner of this car, RK51VHD has balanced the probabilities, accepted the risk and come up with a parking solution that while not "thinking outside the box", is certainly thinking of a box with bigger corners. Which is the kind of risk taking and innovative problem solving that universities are proud to instill in their students. Here we see what Bristol University instills in theirs. And because this cul-de-sac isn't currently scheduled to be part of the Kingsdown CPZ, it's one that they will be able to instill into future students. Returning to the Highbury Villas; first question: does it fill up with commuters, residents or students? Let's look 09:03 and see what has happened. It's pretty sleepy, a little set of dead ends: one entrance road and two side roads. A lot of the housing here is student accomodation, handy for the university, the many excellent pubs and a somerfield that has not yet earned the "fresh" keyword on its sign. If these are their cars, they aren't moving today. The corners are not blocked. There's enough froom for this van to squeeze through. At the end of the road, after the keep clear zone, there's a back entrance for the arts bit of university. This was unexpected, and shows why for a student living here -or parking here- would be so appealing. A secret back route into the arts school. Conclusion: at 9am the road appears mostly full of resident rather than commuter or student cars -though those residents are probably students. A new camera has popped on Whiteladies Road. Discreetly grey, with a bit of yellow on the back. It appears set up to catch cars going down the bus lane here. Presumably this will stop FirstBus buses being delayed on their morning journey into town, and reduce their need to run over bicycles. Assuming, of course, that the problem is moving traffic in the way. Because a single day's study of the lane implies that camera or no, most car drivers aren't going to go down this lane. Why not? Parked cars in the way. The lane is bus-bike-taxi-motorbike only in the mornings, parking rest of day, so the lane is marked out with parking spaces. Which acts a cue: you can park here. And this VW Polo, which has pulled over to take a phone call. For this we must praise them. It is clear from these photos that there are no buses in sight -hence none being held up- and bikes can slide past without having to change into the other lane. Why then, the camera? What it could be used for is to detect parked cars. If it counts vehicles going past, and that number is zero, there are cars parked down the lane so the attendance of Bristol Parking Services is required. Except, how can you distinguish "zero vehicles cars in the way" from "zero vehicles firstbus 'light' schedule". You can't, can you? We get a photo and a message "I had just dropped my child off from school and was on the way to work when I came off on this corner on ice. No warning, and now I am bruised down one side." Well, at least your child had been delivered to school, so can still retain youthfull illusions about the infallability of parents, for a bit longer. And without injuries that would bring you to the attention of social services. It is worth remembering that the roads in the city that get gritted on icy mornings are the main roads, the ones with heavy motor traffic, not the quiet back roads used by bikes. 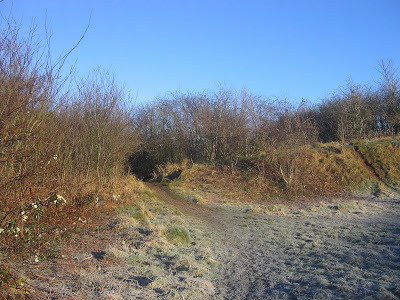 The offroad paths are usually ok, but where cars go they can make things slippery. Station Road from Ashley Hill road down to the footpath under the railway line is particular entertaining in winter -you can get very hurt here without even trying. This raises a question about safety wear. Not the "helmet question", that being the religous war that tears bicycle mailing lists apart. Something better: the Body Armour question. Knee and elbow pads have trickled over from Downhill MTB to cross country. Because it is quite pleasant to not be bruised and scarred after a day in the woods. The Body Armour question extends this to commuting in winter. Given that when you come off a bike, its your elbows, hands and knees that usually hit the ground first, should you wear body armour on the cmmute -if you already own some? Or should people find routes to school and work that aren't so icy? When you consider how much a horse box + horse weighs, this is actually a valid use for a vehicle with bigger engines and all wheel drive. What is surprising is taking a horse to ikea. Having taken a small child round the shop -indeed, having had a small child run off in that shop- it is clear that taking a small child round is a pretty stressful experience. But doing it with a horse? That is bold! The entrance is on this cobbled alleyway. Some children are walking down the middle of the alley. From the other side, the same unusual scene. Parents and kids walking to school. Not only is the pavement free of parked cars, the road itself is open to kids to walk down. From the school run perspective, this is very unusual. 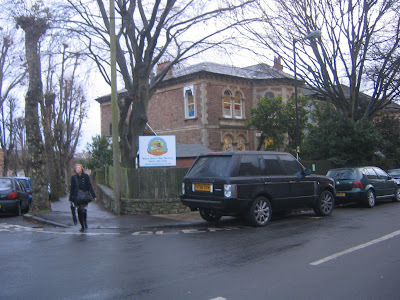 Why does everyone walk to this school, when the others in the area seem to have all their kids come in by car, cars that then have to park up on the pavement. By eliminating the drive-to-school option, it is safer for everyone to walk. Some people may view this as a success. But we at Bristol Traffic view it as a failure. By removing the option of driving to school, the school is not only forcing the parents to walk their kids to school, it is forcing the parents to continue on their journey, be it home or to work, on foot. Therefore it discriminates against people who want to drive to and from work. What's worse, it even creates pedestrian traffic that gets in the way at zebra crossings. We should identify what this school has done, how it achieved this walk to school transport structure, to make sure no other schools attempt it. The car J5AWS is demonstrating the modern purpose of the hatched area across a junction. Historically it meant "do not enter this area unless your exit is clear, its purpose being to stop cars blocking cross traffic and so bring the junction to a halt"
That use has fallen into disrepair. The modern meaning of the sign means "if the lights are about to change, drive into this area and hope that eventually you will be able to get out of it. Do not make eye contact with anyone and act as if it is not your fault"
Which, when you think about it is correct. It's not this car's fault the road in front is blocked. Therefore there is no reason for the driver to feel embarrassed or guilty about the traffic that could not get off Arley Hill because this car was in the way. All that horn beeping the mini driver was doing was rude and uncalled for. After last week's anticlimax at Ashton Court, due to inadequate mud for the time of year, it's good to see a week of heavy rain has brought conditions back to what they should be for early December. Fresh winter mud on a solid base. There's lots of puddles, and around the puddles 1-3 cm of slippery mud; very liquid and hard to gain any traction on. Beneath that there's a more solid layer that tyres may get a bite into. Gate closes at about 17:30; the suspension bridge is open to all traffic. It looks a bit frostier this morning, which may turn the upper layers of mud and water into something crustier. There is a risk here, the "mud bridge", in which you ride onto what appears to be a solid layer of mud only for it to break under your weight and drop you into the pools beneath. Follow mountaineering best practises for glacier work here and send the heaviest and most clumsy person out in front. 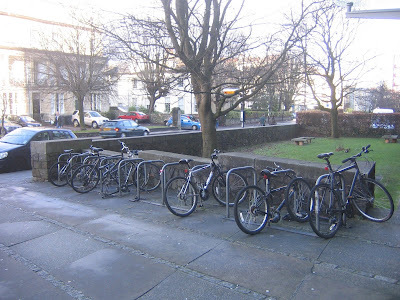 This is the bike park outside the student union, in Queen's Road, Clifton. 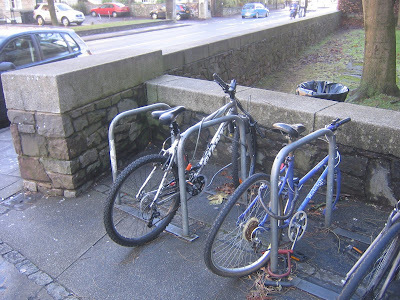 Of the 6 bikes locked up here, only two can be considered functional. 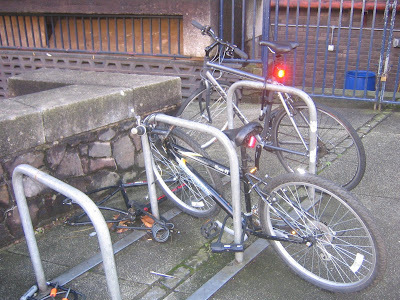 One has been stripped to the frame, another, whose owner took the front wheel off and locked it is without a front fork. At the other end of the rack, one has a stamped on rear wheel and missing front wheel. The bike behind it has the handlebar clamp on the stem missing, which is odd. Perhaps whoever was trying to steal the forks got interrupted, but why remove that part of the stem? Maybe the goal was to steal the stem, or cripple the bike so it ends up there overnight, when the real frame strip can take place. Bristol: don't commute on a bike you value. Yes, but it's so convenient.